The argument of hair is a commonly discussed topic within the African-American community, especially for women. Most Black women see hair as their crown and glory; something that is worthy of pride. This pride of appearance is readily seen within the community, and even in John Killens’ book, The Cotillion. In the song, “I Am Not My Hair” by India Arie, there is a portrayal of this common theme surrounding hair and its texture. The song opens open up with women laughing at Indie Arie because of what she had done to her hair. The song develops with Arie’s journey of her different hair styles, eventually going into the choir which simples states “I am not my hair, I am not this skin, I am not your expectations no” her response to the fact that hair is such a determinant. The women talking and laughing continues with some women agreeing with her hair choices, while other criticizing. The second verse describes how the writer feels about society’s view of hair and about a woman who has lost all of her hair because of chemotherapy, but performing in front of the camera confidently. Growing up with my mom and grandma owning a hair salon, I can really say that I understand the views of women regarding their hair. Hair within the African-American (especially Black Women) community can also be linked with privilege. Regarding Arie’s song, women are very critical about their hair, no matter how it looks. Being nappy or natural to some is very unappealing to many because of the amount of work it takes to maintain. India Arie’s own journey travels not only through time but also through hairstyles and stages in a female’s life. Within the transitioning of this song the author realizes that it is not the importance of the way the hair looks, but about what is beneath; what lies within. She speaks of a woman who has lost all of her hair, yet performing in front of thousands on television. This type of confidence deters from physical appearance, and moves to the whole individual. India Arie’s, “I Am Not My Hair,” is one of many songs that mentions the importance of being true to one’s self. She also helps many Black women realize that it is very important to embrace yourself, and not just your outward appearance! Killens, John. The Cotillion. Saint Paul: Coffee House Press, 2002. Print. Posted in AustinWilliam, ENG359Curation2 and tagged I am not my hair, India Arie, John Killens, song, The Cotillion on March 21, 2013 by waustin3. Part of what came out of the Black Arts Movement was this response to previous notions that Africa was this primitive place that lacked history. The response that many African Americans made was to exaggerate their own images in a style that was “African”, but their concept of what was African was equally narrow-minded. 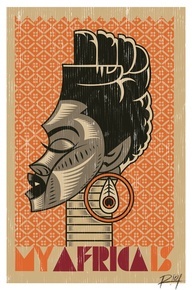 The picture above is titled My Africa Is and features the neck and face of a woman who is presumably African. Behind her is an orange background with some kind of patterned design. The border of the picture is brown and at the bottom is the title of the work in alternating colors of orange and purple. The woman does not face forward but presents the audience with her profile. Her eyes are closed and her mouth is slightly open. She wears what appear to be tight gold necklaces around a long neck and a large orange hoop hangs from her ear. Her hair is cut short with a small bush in the back and from the top of her head, her hair takes on the shape of a closed fist. The closed fist is a symbol that rose out of the Black Arts Movement. It symbolizes the want of unity between African Americans and solidarity. It was also seen as a symbol for resistance against anything associated with white mainstream ideals. Part of this solidarity included embracing African culture however, this culture was construed into a narrow concept by African Americans. This narrow-mindedness can be seen throughout The Cotillion by John Oliver Killen where characters advocated for things such as natural hair and afros versus straight hair. The fact that this woman is dressed is what appears to be traditional African garb can represent how people in America viewed people from Africa. Instead of the previous approach where it was mainstream to view Africans as exotic and “other”, African Americans portray the African people as proud. While the woman in this picture is portrayed proudly, the art and dress from the Black Arts movement fails to represent a broader idea of Africa. Black art at the time suggests that Africans dressed and carried out their daily lives in only one way, ignoring the wide spectrum of African culture. Solidarity was a major focus for most African Americans especially during the Black Arts Movement. Part of this togetherness was to embrace the concept of Africa and adopt it. Posted in ENG359Curation2, SpriggsAutumn and tagged Africa, art, Cotillion, Killens on March 21, 2013 by Autumn Spriggs. Beauty is a commonly sought after ideal in society. People have come to know that in order to be considered beautiful and special by society, people have to like looking at you. Otherwise, you can pretty much forget about enjoying the same advantages as a stereotypically “beautiful” person: a good husband, a good job, and financial security. 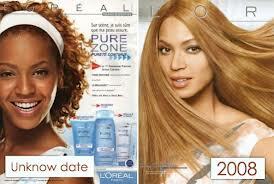 We’ve all seen Beyoncé in ads for various things, as well on the stage singing her music; she’s a well-known icon. We all know her skin color to be a little lighter than many African American women, but never as light as portrayed in the above ad. Looking at the picture above, you can see that her skin is so light, it looks almost like she is a white woman with a good tan, rather than the African American woman with whom she has been known to culturally identify. The woman in the ad next to her, from a date presumably earlier, is shown in all of her “black beauty,” clearly without any retouching at all. Putting these pictures side by side clearly displays the extreme differences in skin color, and even hairstyle between the two women. Since when has the world, especially the US, become that African American women need to become more like white women? It has started with things like face lightener, and now has gone to retouching photos to make African American women seem lighter. What has caused this shift in thinking that somehow darker skinned women are not beautiful just the way they are, and must alter their appearance to “fit in” more with their white counterparts? You can see, looking at the picture above, that if you did not know who Beyoncé was, you would think that she is a white woman. From her hair to her skin color, she exhibits all the positive traits of beauty, for a white woman. Her cultural identity is clearly lost in this photo. Chris Rock, an African American comedian, made a movie that spoke to this fact, titled Good Hair. Like the title suggests, it was a documentary about black women in the United States, and what they do to their hair to make it look more natural, more like a white woman’s hair. This movie is just another example of what a black woman will do to make her hair, or some other feature, look like a white woman’s, to be more accepted in society. The trailer for this film, attached below, in several instances, mentions how black women want their hair to look more natural and flowing, more like a white woman’s hair and less like the poufy, Afro that has been given to them by Mother Nature. African American perception of beauty has changed drastically over time. It has gone from being proud of your blackness, celebrating your dark skin, an ideal synonymous with the Black Power movement, to trying to accommodate the white ideals of beauty into your looks. Women will literally torture themselves to look “more white.” But the question remains: is it worth it? Delicious11. “Re: Perceptions of Beauty and Initial Relations between African and African American Women.” Lipstick Alley. N.p., 7 Dec. 2012. Web. 21 Mar. 2013. <http://www.lipstickalley.com/f373/perceptions-beauty-initial-relations-between-african-african-american-women-455630/index6.html>. Good Hair ft. Chris Rock- HD Official Trailer. YouTube. N.p., n.d. Web. 21 Mar. 2013. <http://www.youtube.com/watch?v=1m-4qxz08So>. The sitcom “Julia” changed African American communities once it hit television networks. Julia portrayed a single widowed African American woman who was raising a son, juggling a career, and finding her own identity. However with relaxed chemical hair, it was unclear whether Julia truly portrayed what an “real” African American woman looked like. Julia to a certain extent appeared to be what mainstream White America thought African American women should look like in contrast to the more Black Natural Hair Movement that was drawing attention in the 1960s and displayed by Yoruba in John Oliver Killens “The Cotillion“. In the advertisement above, Julia is seen as an African American mother with a loving son. However, Julia’s hair is very different from that of African American women of the time. Julia seems to have a relaxer chemical that has taken the natural, thick, and course African American hair and turned it into a more mainstream straight, and manageable hairstyle. During the 1960’s a African American woman’s hair had become a staple in defining what black meant. Women such as Angela Davis sported large Afros to display their Black identity. From this sitcom advertisement, it is clear that the actor Dianne Carroll had to change her hair in order to not only be a television actress but also fit into the mainstream white america. The above clip comes from a scene where Julia is applying for a new nursing job. The doctor calls her and tells her to immediately pretty herself up. Julia seems hesitant and ask the doctor if he knew she was colored. This scene shows the misconstrued conception of what beauty is, which was one of the biggest issue African American faced during the 1960s. Julia doesn’t know whether her beauty would be enough or even acceptable to the white doctor so she makes it a point to let him know that she is colored. In both the sitcom advertisement and the scene, Julia is juggling the idea of beauty with her own identity. In a time where not having natural hair distanced you from other African Americans, Julia portrays the struggles of still trying to remain true to her identity and find a space in white America. Yoruba in the “The Cotillion” faces many of the same issues. She cuts her long beautiful hair into a short natural chop because it was seen as being more “down with the cause” and embracing of her own Black identity. With the idea of beauty, African Americans and mainstream White America floating around, it proved to be very hard to define what pretty meant for African Americans. The struggle continues today also with many young African American woman. It is an internal struggle of prettying yourself up to fit your own identity or the identity others expect you to take on. Image: Julia Advertisement Sitcom. http://www.sitcomsonline.com.August 16th 2005. March 19th 2013. Posted in AndersonCrystal, ArmsteadBrittany, ENG359Curation2 and tagged Black Identity, Dianne Carroll, Julia, One Good Bull Is Half The Herd, Pretty Yourself Up, The Cotillion on March 21, 2013 by barmstead. 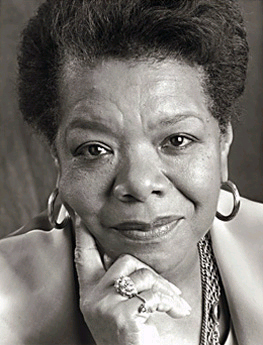 A portrait of Maya Angelou, best known as an American author and poet. Maya Angelou’s poem, Harlem Hopscotch speaks to the struggles that African Americans face living in Harlem while expressing pride in being black. Harlem Hopscotch is the last poem within Angelou’s Just Give Me a Cool Drink of Water ‘Fore I Diiie. Maya Angelou was very well known during the black arts movement, which is the backdrop for the characters in The Cotillion. Harlem Hopscotch is a short poem with an AABB rhyme scheme and uses a description of a hopscotch game to move it forward. Angelou intersperses a description of hopscotch with statements that describe barriers that people face. An example of this comes from the lines: “Food is gone, the rent is due,/Curse and cry and then jump two” (“Harlem” 7-8). Angelou uses vernacular that was common for African Americans in Harlem during the time of the Black Arts Movement. These can be seen in the lines, “Good thing for the ones that’s got./Another jump, now to the left. Everybody for hisself” (Harlem 4). Killens also uses the Harlem dialect in his novel, especially with the character Lumumba. My take on this poem is that Angelou is making a comment on how many barriers African Americans face living in Harlem. The hopscotch game is made increasingly more difficult when the “food is gone, the rent is due” and “all the people out of work” (Harlem 7,9). Dealing with these problems is made even more difficult when they come right after the other. Angelou writes, “In the air, now both feet down./Since you black, don’t stick around” (Harlem 5-6). These lines tell the reader that once one problem occurs, another one will follow if you do not keep moving forward if you are black. Although she describes many setbacks that African Americans face, Maya Angelou also expresses pride in her race. Harlem Hopscotch’s concluding line is, “They think I lost. I think I won” (14). Even after struggling and being at a disadvantage because of their skin color, the African American community should believe that they have won, and have pride in their identity. Maya Angelou wrote Harlem Hopscotch around the time of the Black Arts Movement, which was the time period in Killens’ The Cotillion, and also uses vernacular similar to the characters in this novel. Harlem Hopscotch presents the many hardships that African Americans face, and also expresses pride in her black identity. “Harlem Hopscotch by Maya Angelou.” Black Christian News. WordPress. Web. 19 March 2013. Posted in BryarKristen, ENG359Curation2 and tagged Harlem Hopscotch, Killens, Maya Angelou, The Cotillion on March 21, 2013 by kbryar.